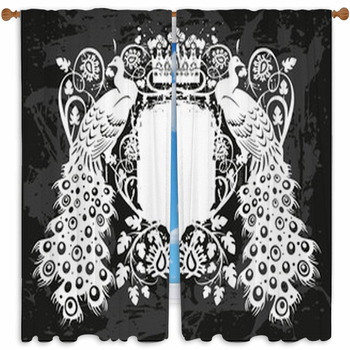 Peacocks possess one of the most beautiful patterns in nature, making an ideal design for home decor. 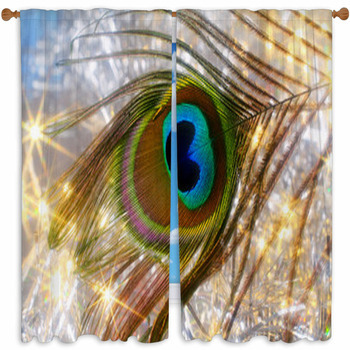 Try VisionBedding's peacock window curtains for a window full of multi-colored feathered glory. Peacock feathers are as beautiful and dynamic as flowers, and we have a window curtain design that depicts a bundle of these lovely feathers held together like a bouquet. Kids also love these strange animals and will appreciate a set of window curtains that display a peacock strutting through a field of grass. 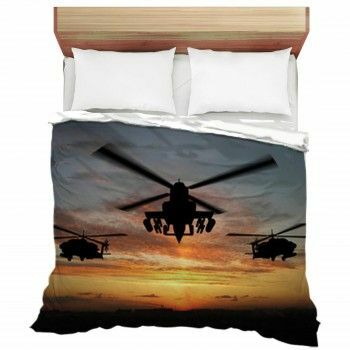 And you can create your own custom peacock designs if ours aren't fluffing your feathers. Try for a clean and timeless black and white look by lowering the hues and vividness of the colors. Or, go the opposite direction and brighten a peacock's luminosity until you can imagine one is actually in your home. Add your photographs to our background for a personalized look, or mix and match our photos with yours to create a peacock farm in your windows. 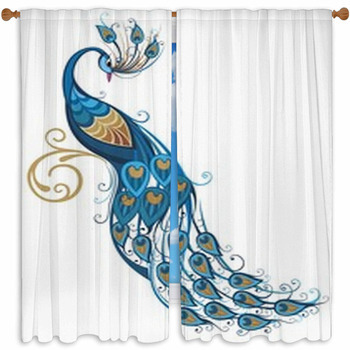 Even add messages and text to customize your curtains with as much personality as any given peacock has. Choose effervescent and ethereal peacock drapes for your living room to create a bright and intriguing mood. 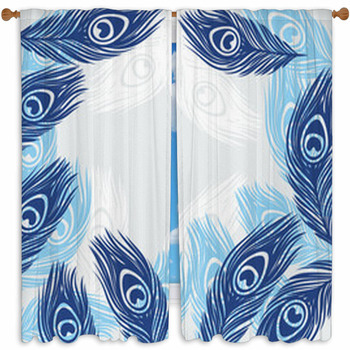 For those full block-out curtains, we have a pattern that displays three separate peacock feathers spread out over a tan and white background. GIve some color to your valances for a close-up of a single peacock feather painted in watercolor style with flowing bands of red, blue and green contrasted to a pure white background. You can also choose custom size window curtains that feature a geometric design formed from peacock feathers, such as eight peacock feathers forming the points of a symmetrical star. These window curtains can create a theme in any space. 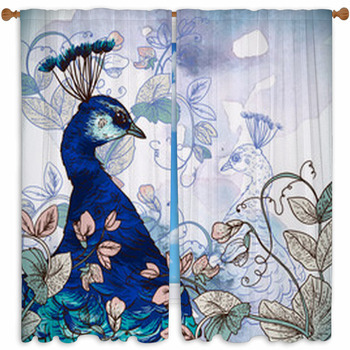 If you want to convey the sense of pride and confidence that peacocks are famous for in your bedroom, choose a set of peacock window curtains that show this fantastic bird in all of its artistic glory. 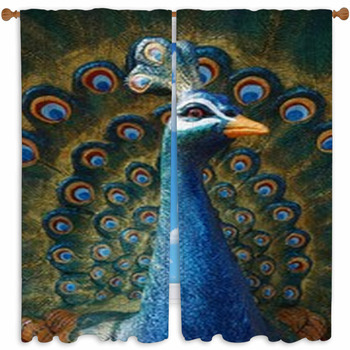 We have a chic window curtain design that features a photo centered around the bright blue body of a male peacock, with the rest of the image covered by the elaborate pattern of a peacock's fan of green, gray, and yellow feathers. If you love the eye-like pattern of peacock's feathers but prefer a different color scheme to suit your bedroom decor, we also have custom peacock window curtains that come in different shades of textured color. 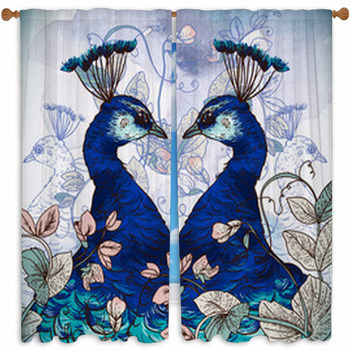 Our peacock window curtain designs are ideal for the stylish adult who is also an animal lover. 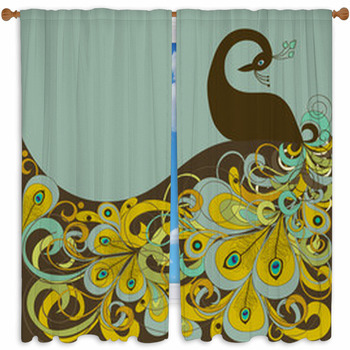 Give your wife the gift of style and grace with these peacock-themed window curtains. 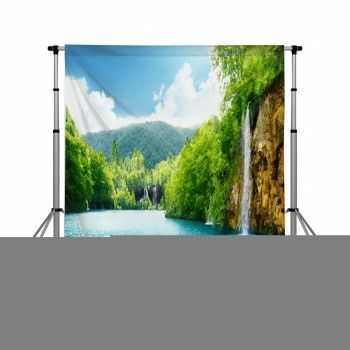 She can pull back the curtains on any window for a look outside, and close those drapes for a view of nature that is just as breathtaking as the one outside. 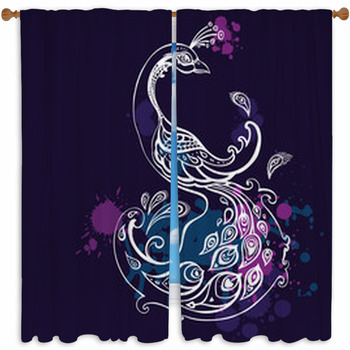 Strut on the wild side while staying classy with VisionBedding's peacock window curtains.